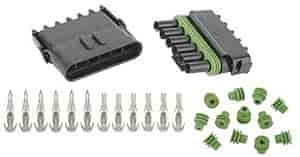 Painless Weatherpack Connector Kits include both female and male connectors to form a weather-tight, quick disconnect electrical connection. Painless Weatherpack Connectors work well under the hood, on taillight wiring and anywhere else you want to keep wiring connections sealed from the weather. Make your own locking quick connect plugs easily and quickly. Each kit includes a male and a female connector and the appropriate number of terminals. Accepts 14-20 gauge wire. For use where rain, dust or other elements may effect electrical connections. Each kit includes a male and a female connector and the appropriate number of terminals. Accepts 14-16 gauge wire. This 22-pin bulkhead connector allows for custom wiring at the firewall or with any other through panel application. Includes all necessary terminals, seals, and connectors. The terminals used with this connector are rated for 20 amps. Accepts 16-18 gauge wire.